Finding a teaching job takes a LOT of planning! This page has information and links to help you in your career planning and job search. I will be updating this page frequently as I find more information while completing my own job search, as well as adding some of my personal experiences! Scroll down for information on teacher resumes, portfolio development, and job search information. Resumes are an essential component of the job search. Many times, especially if you havn't met your prospective employer/school district hiring personnel at a career fair, the resume is what will (or won't) get you an interview. Resumes for teacher candidates need to be professional and offer insight regarding your experiences in education. Resumes for teacher candidates are different from those in other fields for 2 main reasons. The first is length. Teacher resumes generally run about 1 1/2 to 2 pages. The second is the emphasis of the resume. You want to highlight all relevant experience with children (which is why it may run over one page). Some components you may want to include in your own resume are education, classroom experience, relevant work experience, activities, honors, professional affiliations, objective (if you have a specific one), names of references, and relevant coursework. As a new teacher candidate, the bulk of your experiences will probably be from university practica, student teaching, and summer jobs (such as camp counseling). One book I found EXTREMELY helpful is "101 Grade A Teacher Resumes" by Rebecca Anthony and Gerald Roe. You can purchase this book online by visiting the amazon.com online bookstore. Or, to see my resume (as an example of a new teacher candidate resume), click here. Portfolios are becoming more widely used as components of the interview process. They give the hiring personnel a clear view of what your beliefs are about education, what you have done in your past teaching experiences, and whether or not you will fit in with the beliefs of their district or school. Portfolios are a way to showcase your talents and work you've done. A portfolio should document and expand upon the information in your resume. But what do you include? How do you get started? Putting together a professional portfolio is not an easy task. It can't be done overnight. You must start early. If you haven't started yet, don't panic. Much of the "starting early" part is simply saving projects and assignments you've been completing for practicum situations and classroom experiences, as well as for education classes. The other part of planning early is to really think about yourself as a teacher. What is important to you as a teacher? What are your beliefs about how students learn? 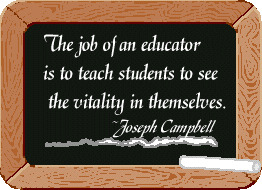 What do you see your role as a teacher in the classroom? Knowing these things about yourself will make your portfolio truly reflective of the educator you are. Professional Resume- see the above section. Philosophy Statement- this is a general statement about your beliefs on teaching and learning. What do you feel is the teacher's role in the learning process? What kind of environment do you see as the most beneficial? What is the role of the community in learning? How do students learn best? This gives employers a clue as to whether your beliefs about education "fit in" with theirs. It should be about 1 page. Examples of Work- lesson plans/units you've created (and maybe taught), with samples of student work if you have them. Photos of you "in action"
you can also add reflective statements or captions to the materials, because they will probably not explain themselves. Remember that all the materials should support your philosophy of education. Basically the portfolio is a way to tell employers what you believe and how you have (and plan to) implemented those beliefs in classroom situations. You can order these online from Amazon.com online bookstore. Eventually you will have to find a job (or you've just wasted your last four years!). The job search is a process not unlike deciding which college to attend. Fortunate for us, education is a labor intensive industry; there is almost always a need for competent teachers. But you probably have ideas about where you want to teach, what type of school you want to work in, and what you want to teach (grade or subject-wise). It is up to you to find the job of your dreams-and you can find it! There are tons of resources on the WWW to assist you in the job search. I've tried to compile the most useful ones (to me) here. Next, you might want to consider going through an agency as part of your job search. Agencies are hired by private and independent schools to find competent candidates for openings. You don't have to be certified (except for primary positions) to teach at most independent/private schools. Here are the addresses of some agencies. Most agencies provide services to teacher candidates (at least those attending school full-time) for free. In addition, you may want to attend a teacher recruitment fair somewhere around the country. Fairs are a great way to meet hiring personnel for school districts and have initial interviews. Most are university sponsored, so if you can't find information in one of the career fair databases, try going to a university career center webpage at a university's homepage in the area you would like to teach. Some of these are open to the public, and some are not. You may even be able to beg your way in to a fair that is only open to students! The K-12 Jobs site has a great listing of teacher job fairs, and links to other job fair sites. In addition, the American Association for Employment in Education publishes two books helpful in the teacher job search. The "Job Search Handbook for Educators", published annually, gives information on the job search process for teacher candidates. The "Guide to Services and Activities for Teacher Employment" includes a wealth of information on job fairs nationwide, referral systems, reciprocity, and interviews. What is the role of the teacher in the classroom? What was your favorite course in college and why? What are your long term career goals? What is the toughest aspect of discipline/classroom management for you? What are some current curriculum trends you are interested in? Describe some projects you have done with students. What is your lesson plan format? What is the role of homework? What is the toughest aspect of teaching today? How would your colleagues/fellow students/professors describe you? What activities are you willing to sponsor if you are hired? What is the ideal classroom comprised of? What areas do you feel you need improvement? What is your position on behavior modification? Tracking? Special Education? Define a superior teacher. What are you hobbies or outside interests? How do you communicate student progress to parents? What do you want to accomplish as a teacher? What methods of assessment do you/will you use? What unique qualities can you offer the students as a teacher at this school? Getting certified is very important if you want to teach in a public school system. However, I have found that it is less important to be certified in the state you want to teach as long as your certified somewhere. This is because of reciprocity. Most, if not all, hiring school districts will still hire you if you are not certified in their state. Once you accept the job, you usually have anywhere from the first day of school to within the first 1-2 years you teach to become certified in that state. Reciprocity does not mean you automatically get certified in another state. What it means is that you get to bypass some (maybe all) of the certification procedures that the state requires for completely uncertified candidates. For example, when I graduate in May 1999 I will be certified to teach Elementary grades 1-8, and Special Education (modified) grades K-12. If I want to teach in, Florida, I will have to take some state certification tests that TN doesn't require. However, it may only be one test and I can teach while I am in the process of meeting those requirments. These details are generally in your hiring contract so make sure you read carefully before signing and accepting a job! Here are is a link where you can find the certification requirements for every state. International schools generally require you to have any state's certification. Also, here is a link to the NTE/PRAXIS exams, given by ETS and used in many states for certification.